Nils Ekholm. Image courtesy Wikimedia Commons. Scientists are expected to live and die on the quality and integrity of their data analysis—but usually that is a metaphor. What prospers or fails is merely their reputation, or at most their career. For Nils Ekholm, meteorologist and physicist, the stake turned out to be his life. When the test came, he was called upon to decide between what the data told him was true, and between what he--and all around him--would have preferred to be true. He had to make that choice in the eye of the press—the “media” of his day. And had he chosen otherwise, there is every reason to think he would have died cold and exhausted in a remote corner of the Arctic. Ekholm was born into a pharmacist’s family on October 9, 1848, in the rural Swedish town of Smedjebacken—“Smith’s Hill” or “Smithy Hill.” The name carries a suggestion of the increasing--and often rural-based--industrialization that would gradually bring Sweden out of the national poverty that had been her lot for a century or more. He went on to attend high school in the mill town of Norrköping, graduating in 1868, and entered the ancient University of Uppsala in the fall of the following year. 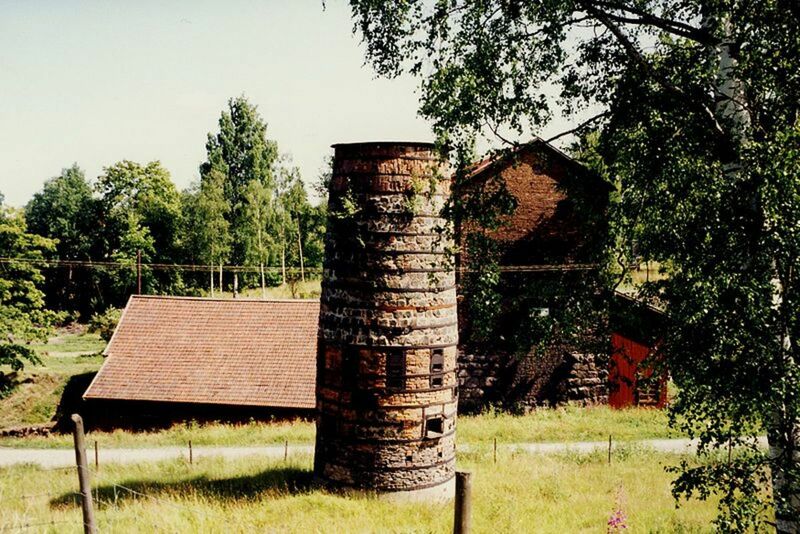 An ancient blast furnace near Smedjebacken. Image courtesy Holger Ellgaard & Wikimedia Commons. Views of Smedjebacken today. 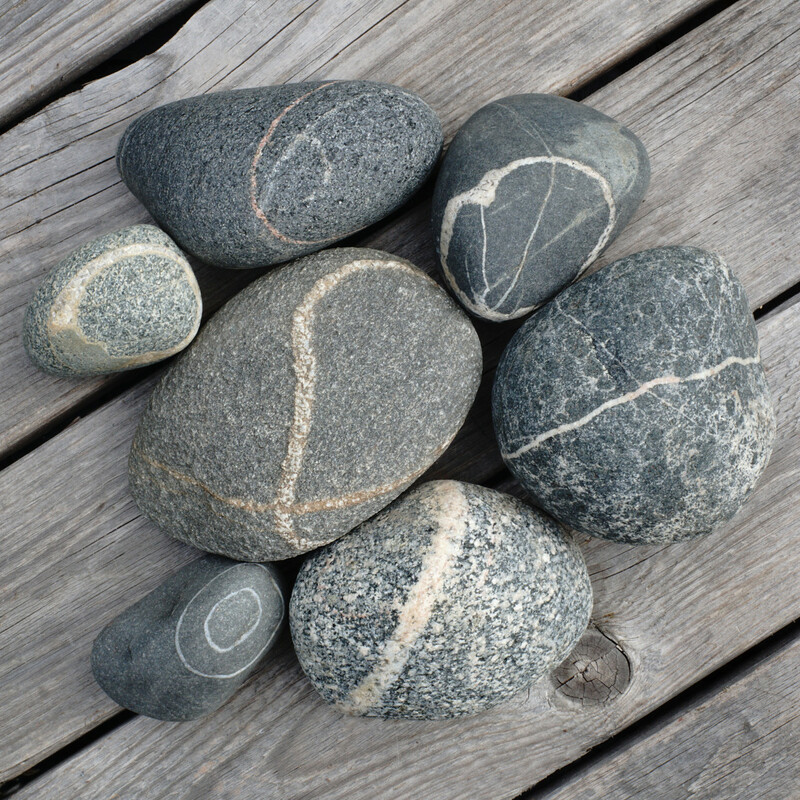 Images courtesy Smedjebacken.se & A. Kraft. 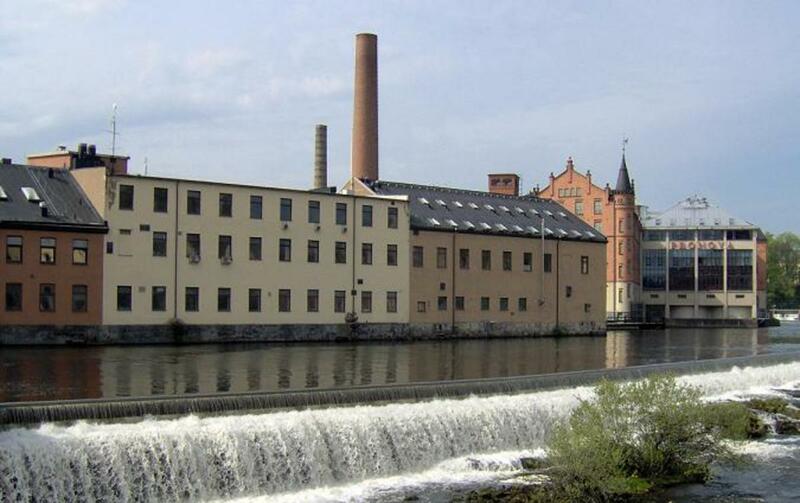 A working river: the Motala River at Norkopping, 2005. Image courtesy Bronks & Wikimedia Commons. University of Uppsala library in winter. Image courtesy Wikipedia Commons. 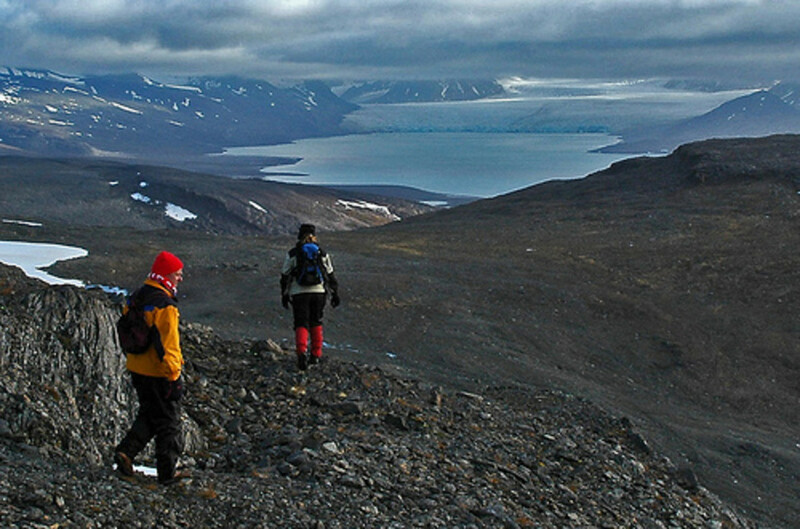 Spitsbergen coast. Image courtesy Stian Danenbarger & Wikimedia Commons. He seems to have acquitted himself well. Certainly he made some valuable contacts, and must have learned much from the experience. One particularly fateful contact would be Salomon August Andrée, another amanuens, who had been employed at the Royal Institute of Technology in Stockholm. A mechanical engineer by training, Andrée was responsible for electrical measurements of the atmosphere, a subject in which Ekholm would later demonstrate considerable interest. Despite Ekholm’s leadership experience, upon his return from the expedition he once again took up his old post. But in 1885 he published his first scientific paper, titled Measurements of the heights and movements of clouds. Soon he was again studying at Uppsala, receiving the Licentiate degree in 1887, becoming Docent in 1888, and achieving the PhD in 1889. He had continued to publish scientific papers, and in 1890 his productivity was rewarded with an appointment to the Central Bureau of Meteorology in Stockholm. He was further recognized in 1892 with an honorary membership in the Royal Meteorological Society of England. 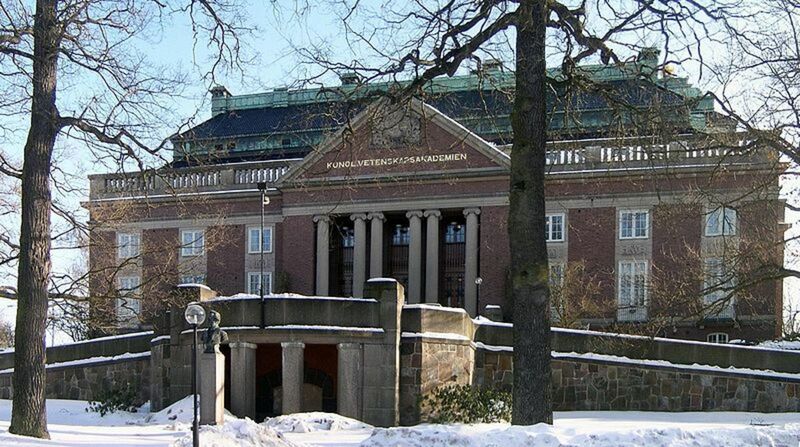 Royal Swedish Academy of Science. Image courtesy of Hackspett & Wikimedia Commons. Yet Ekholm was still not part of the established scientific elite. Swedish science’s “old guard” was not to be found in the capital, but in professorial chairs at the long-established universities of Uppsala (founded in 1477) and Lund (1666). Ekholm responded to this professional challenge by forging ties with other scientists working outside the traditional circle. At the recently founded Stockholm Högskola (university college), for example, was Svante Arrhenius, who had already transformed chemistry (though not all chemists were yet willing to admit it.) The Norwegian mathematician Vilhelm Bjerknes, who contributed so much to the foundations of mathematical meteorology, would arrive there in 1895. 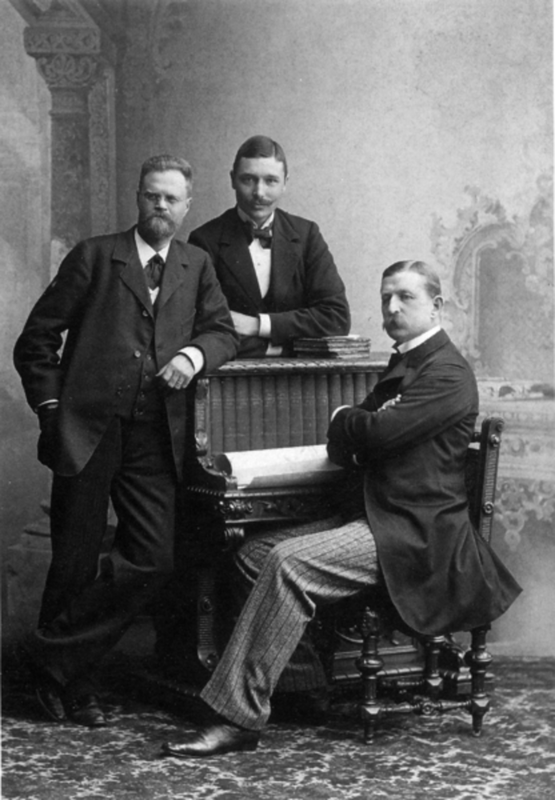 With Ekholm, Arrhenius and Bjerknes would be the leading lights of the Stockholm Physical Society. There, they and their colleagues would make shrewd use of the press to generate public awareness and support for their work. Also in Stockholm was the Royal Academy of Sciences. Founded in 1739 as a more practically-oriented counterpart to the older Royal Society of Sciences in Uppsala, its relatively greater emphasis on the useful application of scientific knowledge was symbolized by its choice to publish its proceedings in Swedish, rather than the traditional Latin. 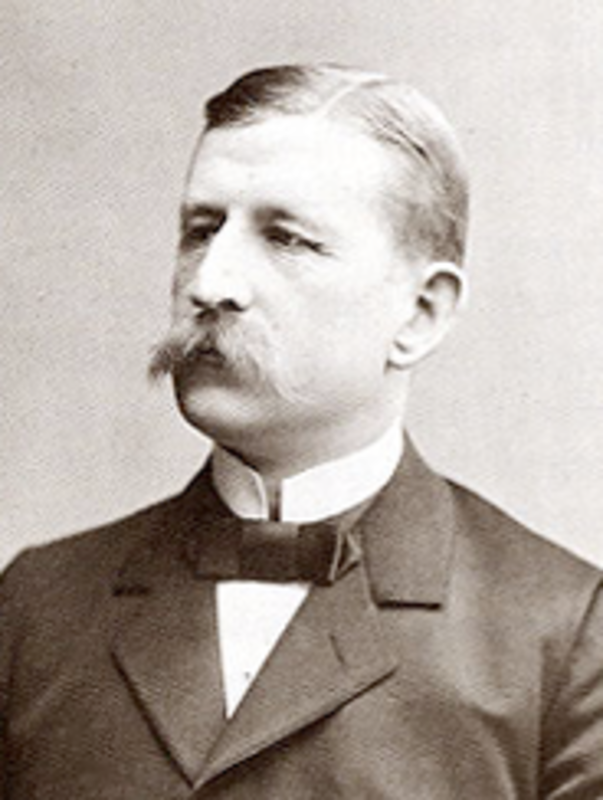 Arrhenius was a member there, too; so was geologist and Polar explorer Adolf Nordenskjold, the leader of the first expedition to navigate the Northeast passage. Adolf Nordenskiold, as painted by Georg Rosen in 1886. The Academy would be central to a new development—new set of scientific and cultural prizes, endowed by the inventor of dynamite, Alfred Nobel. These new “Nobel Prizes” would be a godsend for the Stockholm scientific circle. An annual event honoring scientific innovation in the service of humanity by awarding large cash prizes with the utmost in pomp and solemnity, the Prizes fit naturally with their agenda and style. Nor was the glorification of Scandinavian, and specifically Swedish, science uncongenial to the Stockholm coterie. And of course, the Academy was in charge of the selection process. S.A. Andree. Image courtesy Wikipedia. Amidst all this scientific productivity, Ekholm reached a personal milestone in 1895, marrying Agnes Elpidina Boden. One sees in these facts the picture of an increasingly successful middle-aged man—someone in control of his life, someone doing worthwhile and rewarding work, and now preparing to begin a new family life. Of course, life tends not to move in straight lines, and surprises were in store for Nils Ekholm. His old colleague Andrée had been bitten hard by the aviation bug back in 1892. Though Samuel Langley in the US was achieving his greatest successes flying steam- and gas-powered models in 1896, actual human flight at the time meant using balloons. Beginning in 1893 with the purchase of a hydrogen balloon which he named Svea, Andrée had experimented with methods of controlling direction in balloon flight, inventing a system combining drag ropes and sails. He believed that he had achieved his goal of directed flight; modern experimenters believe that he allowed himself to be deluded by his own excessive optimism. But he made nine long flights in the Svea--crossing the Baltic Sea to Finland on one--and had used the drag-rope-and-sail system on several of them. Andree's first balloon, Svea. Image courtesy Wikipedia. But his goals were much more ambitious than mere trial flights. Nordenskjold had been ennobled for his exploration of the Arctic and was rich and famous--a very important person indeed. Andrée, by contrast, was only moderately successful, with his steady but unexciting position at the Patent Office, and a term served on the Stockholm city council. But what if he could use a balloon to visit the North Pole--the Holy Grail of Arctic exploration? That would out-Nordenskjold Nordenskjold himself. There would few limits for the man who could achieve such a thing. So Andrée laid his plans. A bigger balloon would be needed, and scientific observations were de rigueur; it would not be an inexpensive venture. But Andrée’s flights in Svea had achieved considerable public attention, after all, and he was a published scientist with Arctic experience. He was also a strong public speaker with considerable skill in politics—including appeals to the public. His presentations quickly found (or created) public enthusiasm, and better yet attracted financial backing from the Royal Swedish Academy, King Oscar II, and Alfred Nobel. Andrée commissioned a new three-layer, 67-foot diameter balloon—to be dubbed the Örnen (Eagle.) It was meant to carry a three-man crew. Plans were laid; the expedition would take to the air from a base on Danskøya, an island of the Svalbard Archipelago, where a special plant would synthesize the necessary hydrogen. Aboard the balloon would be Andrée himself, Nils Strindberg--a young photographer and physics student already doing advanced research--and Nils Ekholm. The crew for the first attempt on the Pole, 1896. 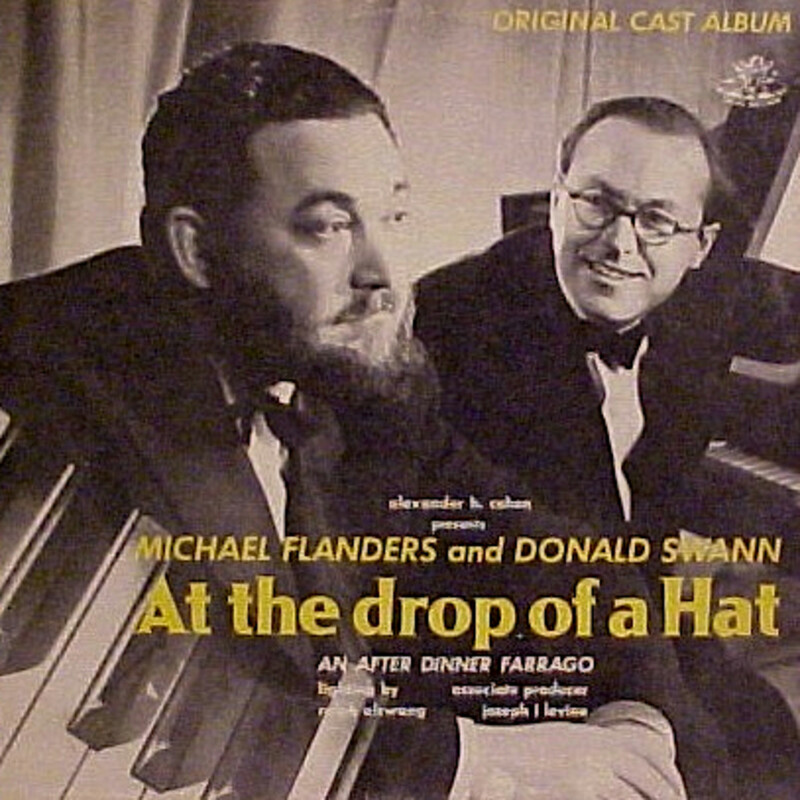 From left to right, Ekholm, Strindberg, and Andree. Image courtesy of Bishonen Lundstrom & Wikipedia. The departure of the expedition was a riot of enthusiasm. 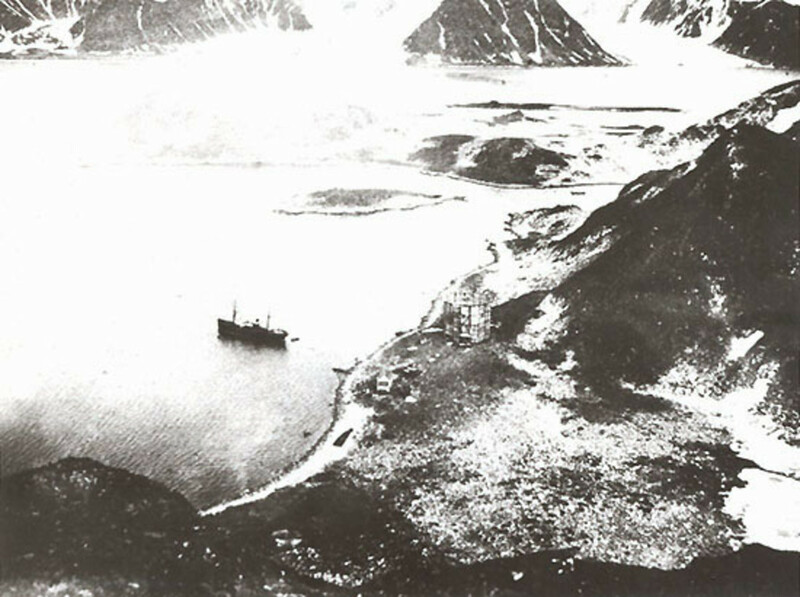 But once the Svalbard base was established and the balloon inflated, luck seemingly turned against Andrée and his crew. Day after day, the wind blew unrelentingly from the North. It was quite contrary to Andrée’s prediction, and far beyond the range of the 27-degree deflection from wind direction of which he believed the Örnen capable. Back home, the papers faithfully reported this embarrassing delay. Andrée could do little except chafe. But there was worse. Ekholm was responsible for monitoring the balloon’s lift capacity. According to the plan, capacity was to be sustained for 30 days in order to ensure a safe transit of the Arctic. But though every attempt had been made to seal the balloon’s envelope as tightly as technology allowed, there were an estimated eight million needle holes in the fabric underneath the sealant—and hydrogen is notoriously difficult to contain. Measurements showed a daily loss of 68 kilograms of lift; Ekholm estimated this rate would allow a mere 17 days airborne. Puzzlingly, at times the decline would mysteriously reverse itself. Could the measurements contain some unknown source of error? The harbor at Danskoya, with the Virgo at anchor. In the end, the wind never turned. There was no alternative but to pack up and return home. But Ekholm told Andrée that the issue of the envelope must be solved, or he would not participate in future attempts. This could not have been an easy decision. Ekholm likely knew very well that he would be criticized for withdrawing; already a source of national pride, the expedition was expected to put Sweden at the forefront of Arctic exploration, vaulting her past her sometime possession, Norway. Ekholm might well be called a shirker. Nor would his conversation with Andrée be easy—Andrée in his disappointment resisted acknowledgement of Ekholm’s concerns more or less completely. Yet the message of the lift data was clear. It was only on the return voyage itself that Ekholm would learn from the chief engineer of the hydrogen plant how the anomalies in his lift measurements had come about. Andrée had ordered that Örnen be secretly topped up with hydrogen! It must have been a shock to Ekholm: in essence, Andrée knew, or should have known, that Ekholm was right. Did Andrée somehow deceive himself with what would later be called “doublethink,” fearing the embarrassing revelation of the expensive balloon’s design deficiencies? Was he afraid that there would not be a second chance, if a new balloon had to be commissioned? In any case, he would not reconsider. The Örnen would fly the following season, with or without Nils Ekholm. Ekholm's replacement, Knut Fraenkel. Image courtesy Wikipedia. As expected, Ekholm’s decision was criticized by some in the press. How could Ekholm fail to take his part in carrying forward Sweden’s national destiny? And it is always too easy to confuse prudence with cowardice. But though the non-events of the first attempt did dampen enthusiasm somewhat, Andrée had no great trouble finding a replacement. Now it would be Knut Frænkel—another engineer and Royal Institute of Technology alumnus—who would sail off to aeronautical and meteorological glory. 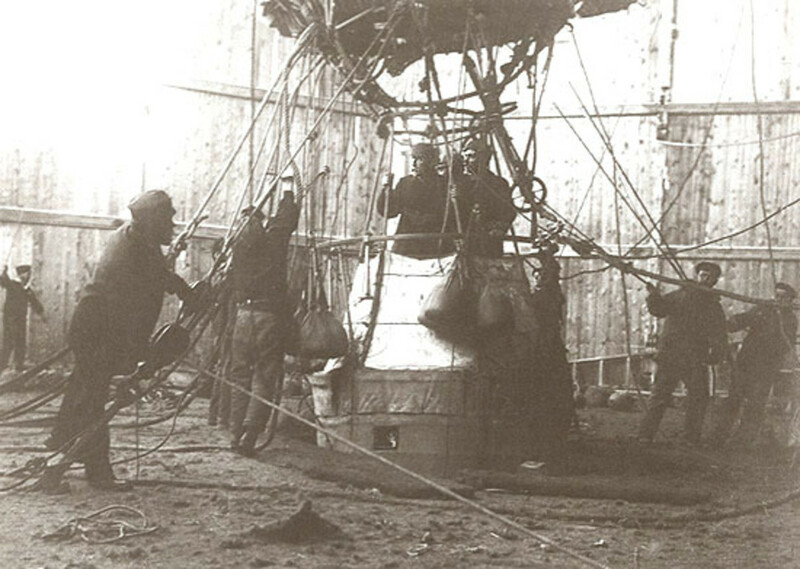 At first the 1897 expedition seemed to go better: the base was reached with relatively little trouble on May 30, and June 22 saw the beginning of the inflation process, with workmen painstakingly sealing and testing the expanded envelope. And on July 11, a brisk southerly wind sprang up. Final preparations were made, and at 2:30 PM the balloon was launched, quickly climbing to about 300 feet. But luck turned at once: somehow the drag ropes had become disconnected from the balloon, remaining on the shore. And as quickly as Örnen had climbed, she was forced down again by air currents, till the basket touched the frigid waters. The sails were trimmed, and precious ballast dropped; soon the balloon rose to an estimated 1,000 feet and disappeared into the Arctic sky. The first message from the expedition was received on July 15th, when one of the carrier pigeons carried aboard Örnen was retrieved by a Norwegian sealer. It read: ‘From Andrée’s Polar Expedition to Aftonbladet, Stockholm/13th July 12.30 midday, Lat. 82 2′ Long. 15 5′ E. good speed to E. 10 south. All well on board. This is the third pigeon post. Andrée.’ Sadly, nothing more would be heard until May, 1899, by which time hope for the survival of the Expedition members had waned considerably. 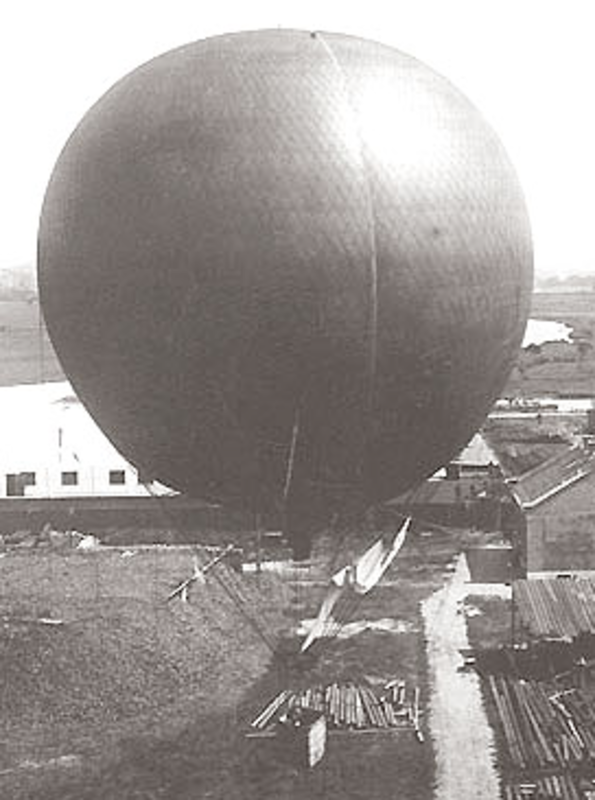 Ekholm maintained his interest in ballooning, becoming the founding chairman of the Swedish Aeronautical Society in 1900. 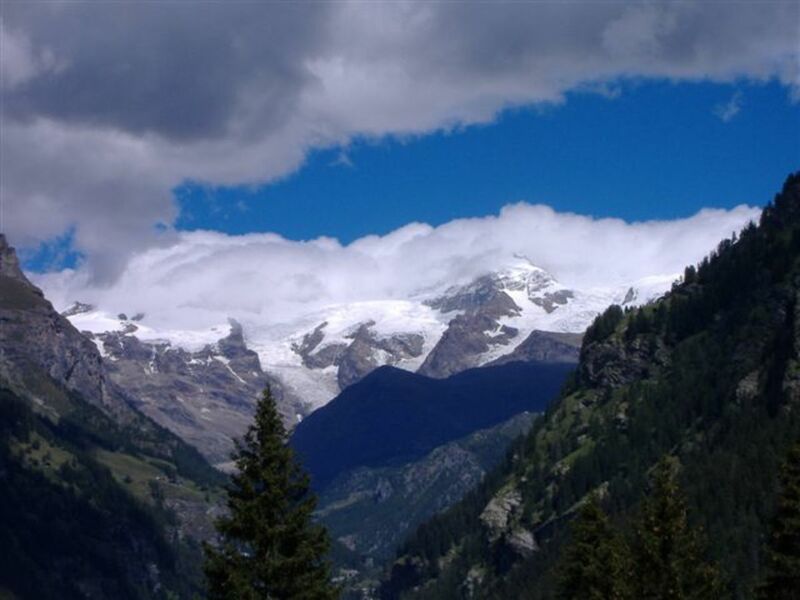 How better could meteorological data from high altitudes be gathered? In addition to his work at the Meteorological Bureau, he continued to publish scientific papers. Of particular interest is his 1901 paper “On the variations of the climate of the geological and historical past and their causes,” published in January of 1901 in the Quarterly Journal of the Royal Meteorological Society. The paper is a clear example of the “cosmical” mode of Swedish physics championed by Arrhenius. Visionary and at times highly speculative, it considers many questions--from the age of the Earth as estimated by various means, to the influence of orbital forcings upon the climate, to the characterization of the historical climate regime often known today as the “Medieval Warm Period.” It seeks to synopsize and synthesize the best knowledge then available on the topic of CO2 and climate change. As such, it is a remarkable mix of now “dated” nineteenth-century science and ideas that sound quite modern indeed. In some passages, one can see both qualities at once. For example, Ekholm considers, but finally disposes of, two of the terms in Fourier’s old heat budget: the contributions of heat from the Earth’s interior and from the “temperature of space.” Measurements showed both the conductivity of rock and the temperature of space to be too low to allow either a significant contribution to Earth’s heat budget. 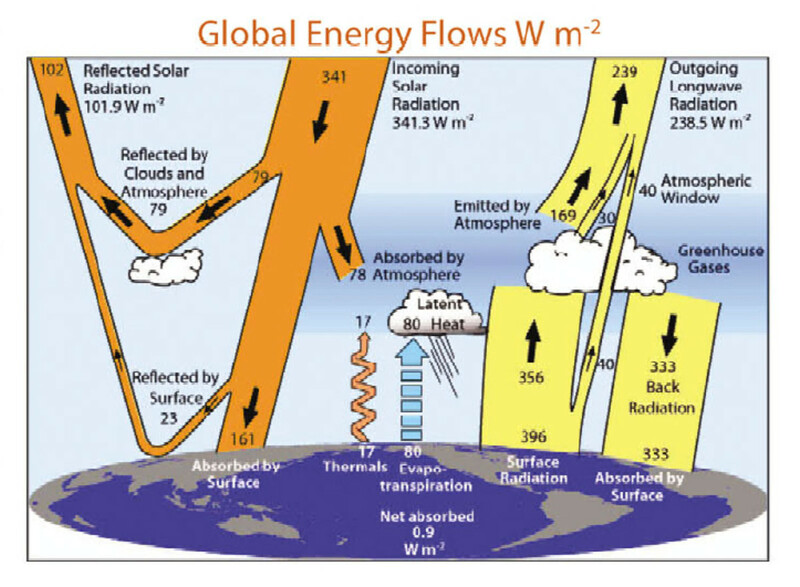 Earth’s surface energy input is nearly all due to solar radiation. Earth's energy budget, from Kiehl & Trenberth, 2008. Image courtesy NASA. Mt. 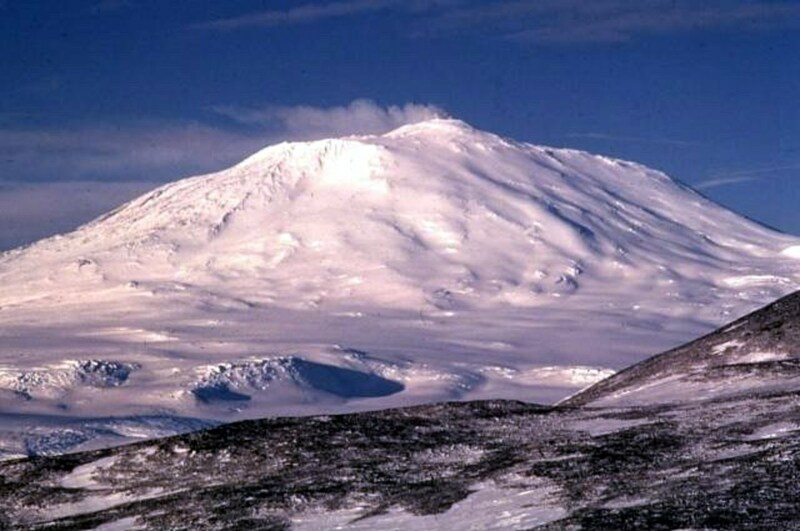 Erebus, Antarctica. Image courtesy Richard Waitt, PD-US & Wikimedia Commons.
. . . radiation from the earth into space does not go directly from the ground, but on the average from a layer of the atmosphere having a considerable height above sea-level. . . The greater is the absorbing power of the air for heat rays emitted from the ground, the higher will that layer be. But the higher the layer, the lower is its temperature relatively to the ground; and as the radiation from the layer into space is the less the lower its temperature is, it follows that the ground will be hotter the higher the radiating layer is. This is a key concept, in effect answering Knut Ångström's 1901 contention that CO2 absorption was "saturated"--that is, that additional CO2 would not increase infrared absorption because absorption has already reached its maximum. Unfortunately, the significance of Ekholm's formulation was largely overlooked at the time, and development of CO2 theory was sidetracked in a blind alley for several decades. Thorough mathematical treatment of this aspect would have to await Gilbert Plass and the advent of electronic computing in the late 1950’s. Gilbert Plass. Image courtesy AIP. Ekholm does not fail to consider astronomical influences as an alternate explanation for climate change. Though Milan Milankovitch would not perform his definitive calculations of the Earth’s orbital cycles for three decades yet, the Serb was not the first to consider the effects of cyclic orbital changes. Ekholm cites work on the “obliquity cycle” performed by J. Croll and by J.N. 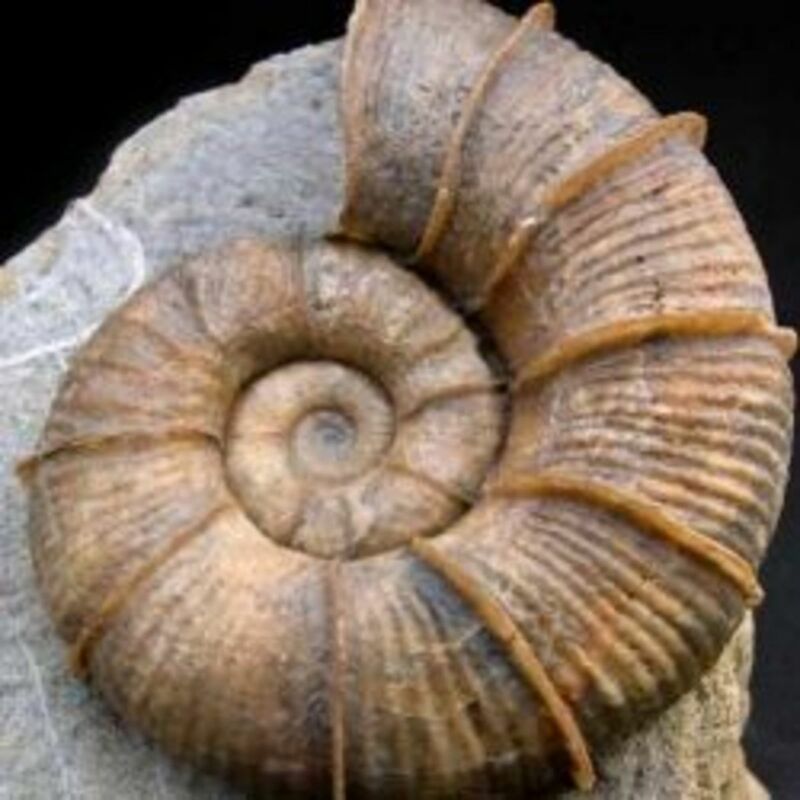 Stockwell, and allows that, although CO2 is the “principal cause” of the ending of the Ice Age, obliquity changes may have provided a “material” contribution. 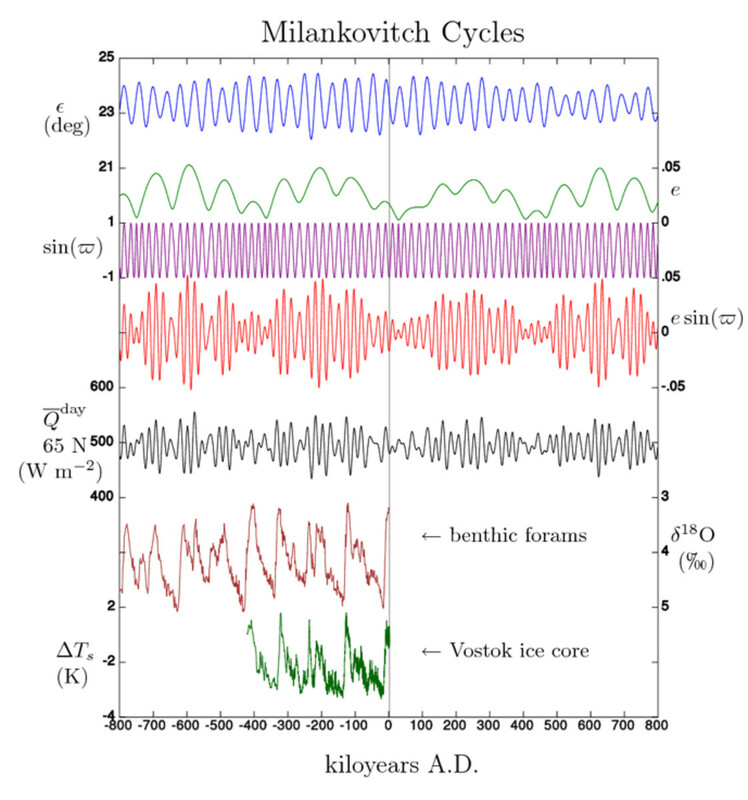 Milankovitch cycles. Graphic courtesy Wikipedia. 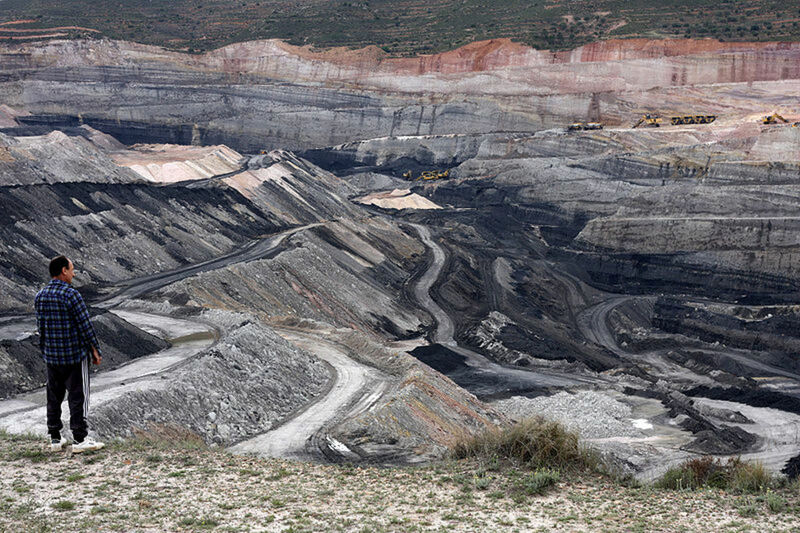 A modern coalpit mine, Estercuel, Aragon, Spain. Image courtesy of Jennifer Woodard Maderazo and Wikimedia Commons. “Cosmical,” indeed! But the closing years of Ekholm’s career would be dominated by matters quite practical. In 1902, Ekholm was considered as a candidate for Director of the Bureau of Meteorology, and seems to have been seen as the candidate of those focused on a dynamic and practically-oriented meteorology—a perception he may well have been at some pains to foster. For example, he was described by one daily paper as “a man with initiative and energy . . . the most agile and active of the Bureau’s staff.” Despite such support, the job went instead to Hugo Hamberg, whose professional focus was the study of the climatic effects of forests and peat bogs. In December, however, southern Sweden was struck by an intense storm; widespread damage was incurred and people died. 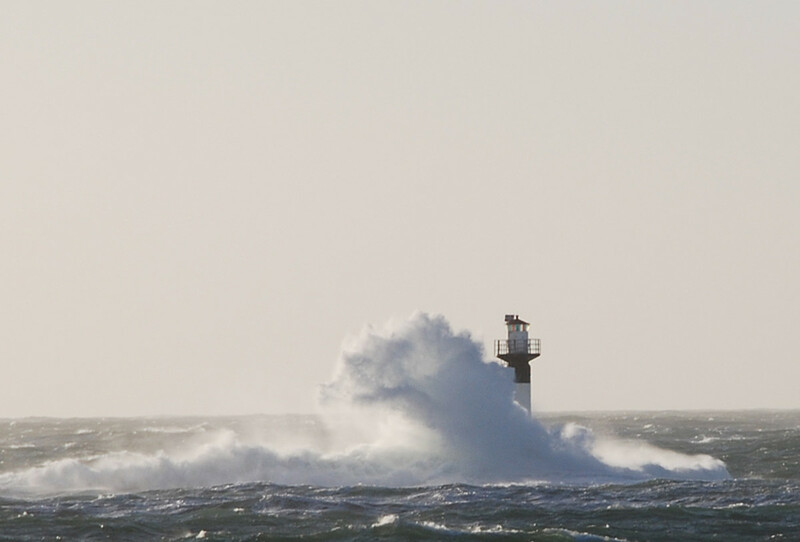 Within two weeks, Ekholm kicked off a campaign to institute a Swedish storm warning system with a public meeting at the Royal Academy of Sciences. In attendance was the new Director, as well as high-ranking maritime, naval and governmental officials. This was followed up a month later with an address to the Physics society, in which Ekholm described efforts to use modern technologies, such as balloons equipped with automated meteorological instruments and telegraphy, in the service of better storm prediction. Ekholm continued his campaign in the press. Shrewdly, he also built political coalitions with both scientific allies--such as Vilhelm Bjerknes, who was already promising to transform meteorology--and stakeholders such as Swedish merchants, fishermen, and seafarers. A storm on the Swedish coast. Image courtesy Wikimedia Commons. The Bureau had actually had the task of issuing storm warnings since 1872; the Swedish parliament had followed other European nations in mandating this function when it first allotted funds to create the Bureau. However, no system had actually been implemented. Ekholm used his by now well-honed skills of “science by press release” and political coalition-building to remedy this deficiency--and to great effect. In September of 1905, a newly-instituted system began distributing warnings to 27 stations along the southern and western coasts of Sweden. Perhaps not so coincidentally, Ekholm was elected to the Royal Academy of Science that same year. But Ekholm did not simply declare victory at this point. Rather, he worked to expand and improve the system, both technically and in terms of what we would now call “user-friendliness.” Conspicuously, he obtained grants in 1906 and 1907 from the Merchant and Seafaring Foundation to improve forecasting, noting that Bureau “resources were being used for other tasks.” It is easy to read into this wording, with its tacit criticism of official Bureau priority-setting, an ongoing bureaucratic and political conflict. These efforts, too, were ultimately successful; the warning system was seen by both users and the press as a success. Within a few years, seafarers on other parts of the Swedish coast were asking for an extension of the service to their waters and in 1913 parliament acceded to this request with an allotment of funds. Actual implementation would be delayed by the outbreak of World War I in 1914, which disrupted the international sharing of weather information, but eventual success was secure. 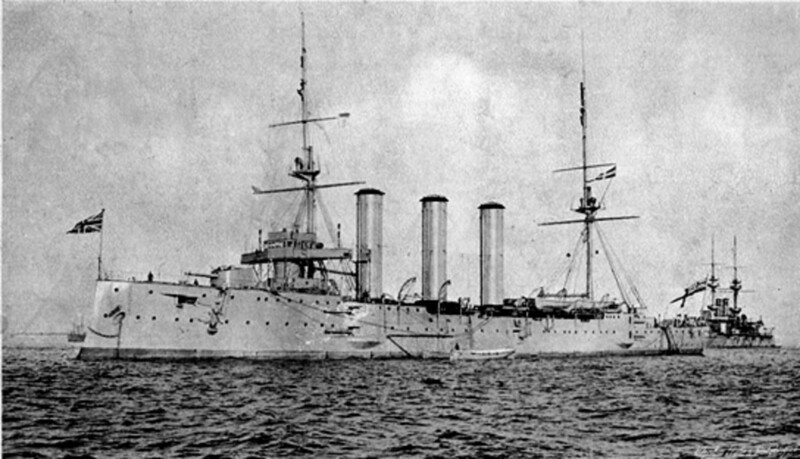 HMS Monmouth was one of the early naval casualties of WW I. She was sunk with all hands in the Battle of Coronel, off the Chile coast, November 1914. Naval fleets of the day were coal-powered. Image courtesy Wikimedia Commons. Once again Ekholm reaped a professional reward with his appointment as Director of the Bureau. The road had been long, rocky and at times circuitous, but the long-time amanuens had arrived. But there was an ironic coda. 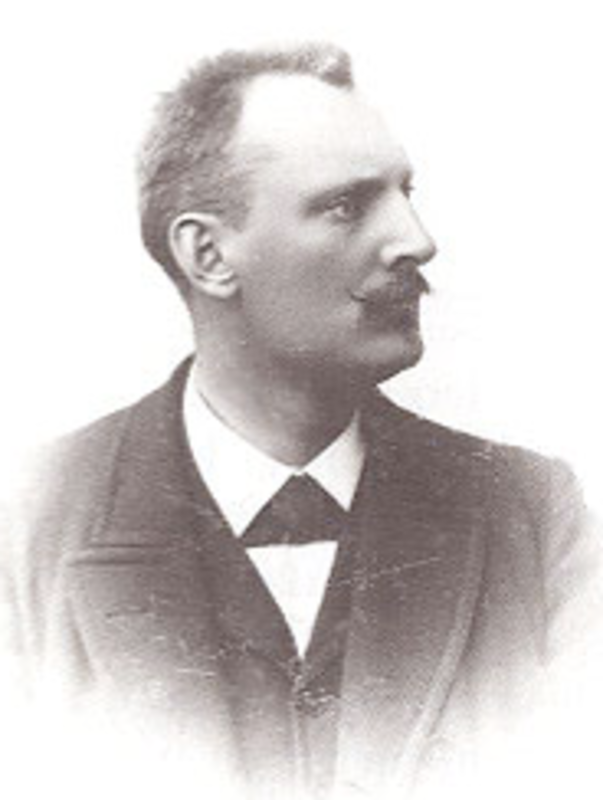 Back in the 1890s Ekholm had been associated with Arrhenius’s “cosmical” investigations of the effects of astronomical--and particularly Lunar--influences upon weather. Such considerations, however, had no place in the predictive methods of the Bureau. 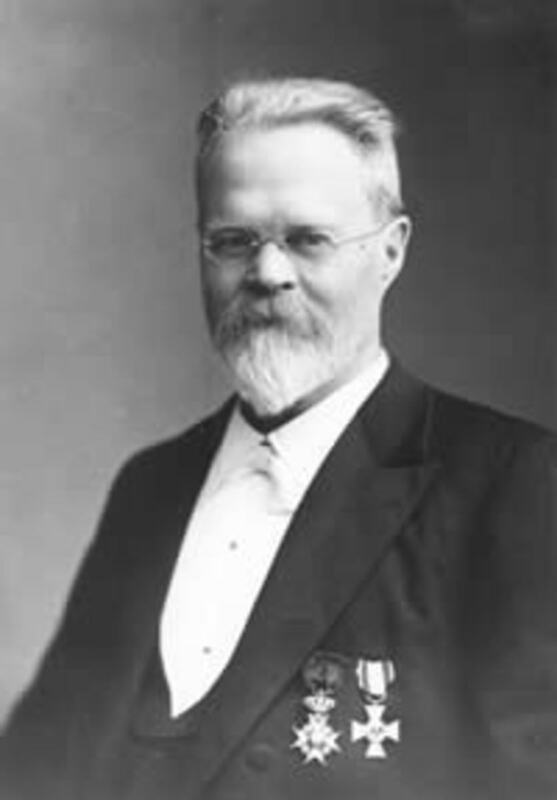 But in 1913, the very year of Ekholm’s triumph, Gustaf Strömberg, assistant astronomer at the Stockholm astronomical observatory, put forward a “cosmical” challenge to the Bureau, using much the same press techniques so familiar to Ekholm. Just as Andrée had tried to out-Nordenskjold Nordenskjold, now Strömberg was trying to out-Ekholm Ekholm. 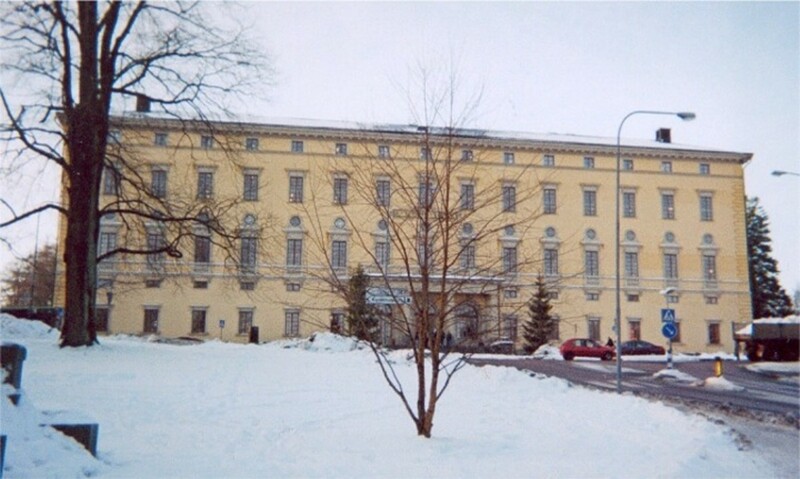 Strömberg negotiated leave from his position at the Stockholm observatory, raised money with which to pay computing assistants and equipment and attracted considerable favorable public notice. For example, the same paper which had praised Ekholm back in 1902 now wrote “[How] easy it is for the most uneducated to confirm the amazing correlation between the curve he has calculated for this year and the observed temperature. . . Mr. Strömberg’s reputation as an authority on the weather has got further support. . .” Accordingly, the paper bought his predictions for November and December 1902, evaluating them in a series of articles. As has often happened when amateurs find amazing correlations between various phenomena and weather, however, the apparent link broke down with time. 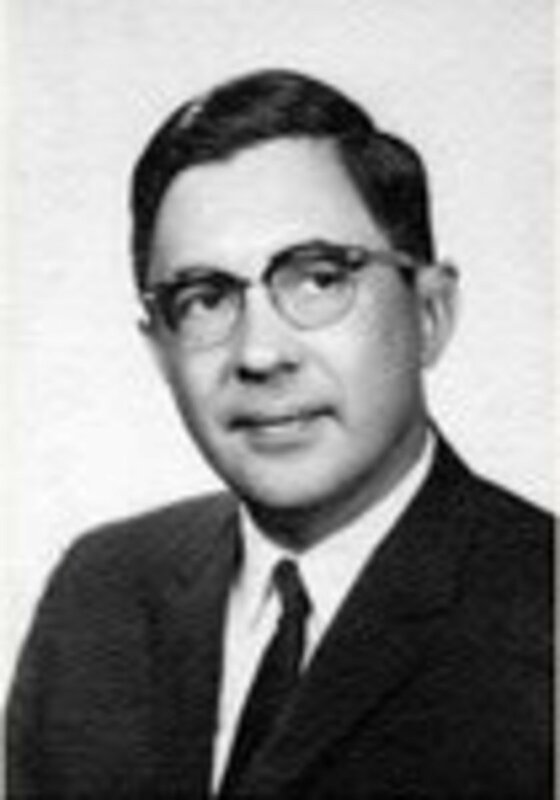 Strömberg’s enterprise failed, and he returned to astronomy, eventually working at the Mount Wilson Observatory in the United States. 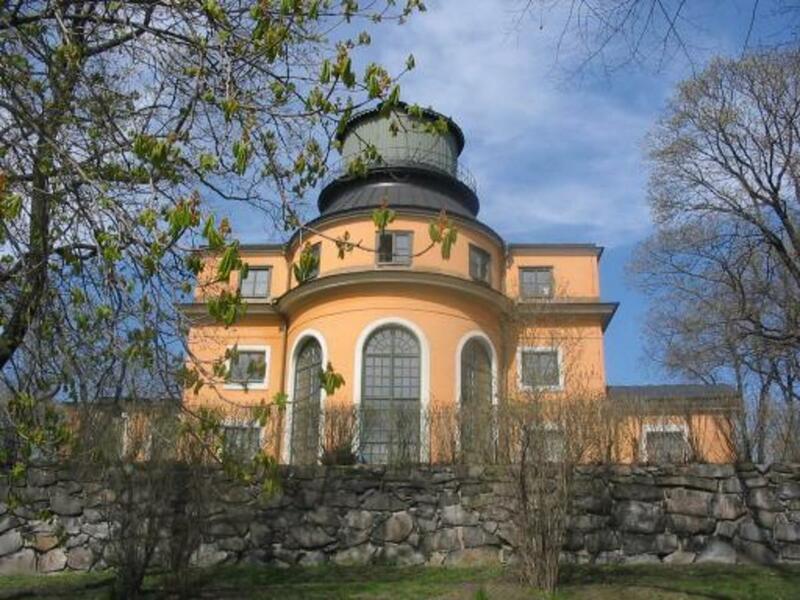 Stockholm Observatory. Image courtesy Andrea Ribbefjord & Wikimedia Commons. It would only be in 1930--at the beginning of what would prove to be a decade of relatively warm global temperatures--that yet another Norwegian sealer happened upon the remains of the Polar Expedition. Diaries and photos told the tale: Andrée, Frænkel and Strindberg had been forced down on the ice on the 14th of July, and had made a harrowing trek south in brutally difficult conditions. 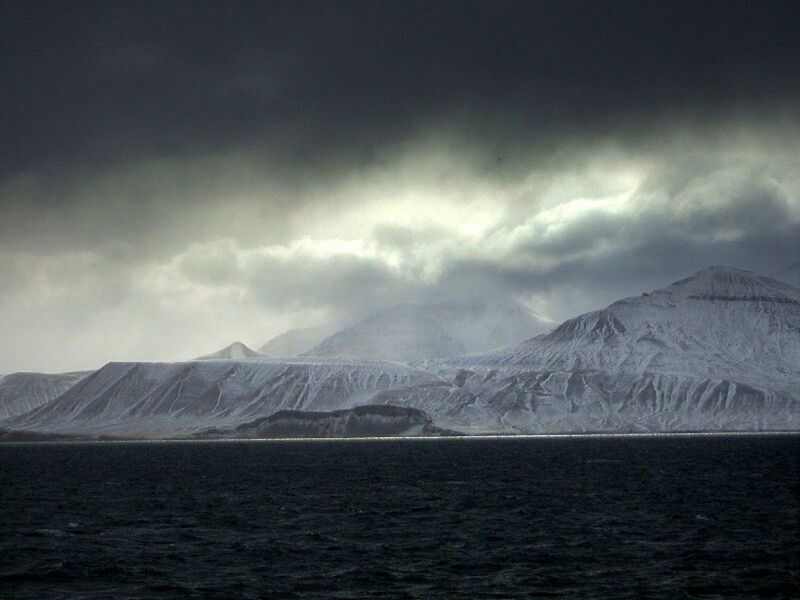 They had succumbed to their hardships in early October, shortly after reaching the island of Kvitøya, east of the Svalbard archipelago. Their bodies were returned to Stockholm on October 5, 1930. They were received as heroes who had died in the service of science and progress; historian Sverker Sörlin called their cortege “one of the most solemn and grandiose manifestations of national mourning that has ever occurred in Sweden.” Their courage, fortitude and ingenuity are indeed praiseworthy. The "Eagle" crashed. Though the camera weighed about 15 pounds, Strindberg documented the Expedition's life on the ice with over 200 photos, more than 90 of which survived intact. 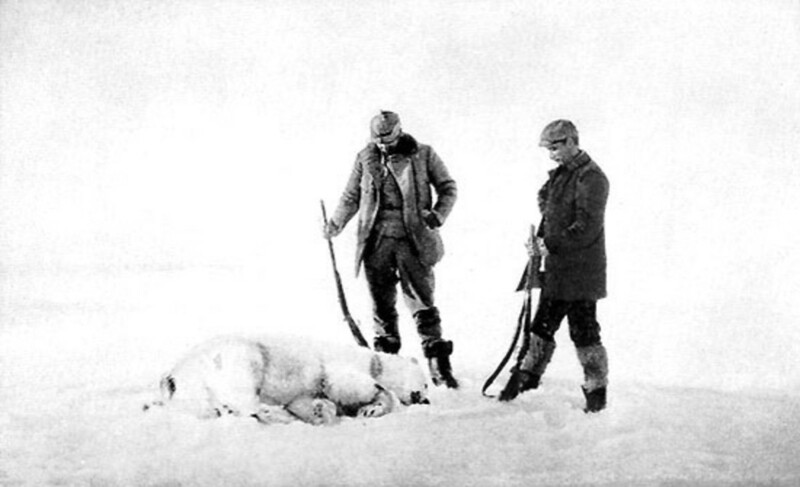 Expedition members depended upon polar bear meat to supplement their provisions during their attempted return. But let us praise Ekholm, too. 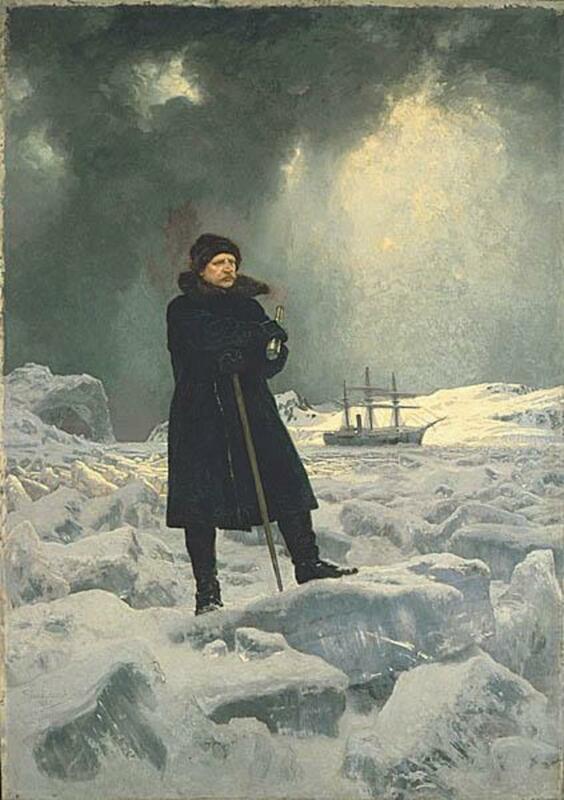 He dared not only the physical dangers of the Arctic—with which he was acquainted from his service on the 1882 expedition—but also the social and moral dangers of bringing an unpopular message to both his leader, Andrée, and to the public at large. Equally daring scientifically in his “cosmical” speculations, and politically in his public challenge to the leadership of the Central Bureau of Meteorology, he nevertheless remained grounded in that most central of scientific attitudes: respect for what the data show. From Smedjebacken to Uppsala to Svalbard to Stockholm, this quality, above all his other virtues, served him well. His death may have been less-commemorated than those of fellow-aeronauts of the Örnen, but his life was many times more beneficial to Sweden, to himself and his family, to the institutions he served--and to the science which had been his life. 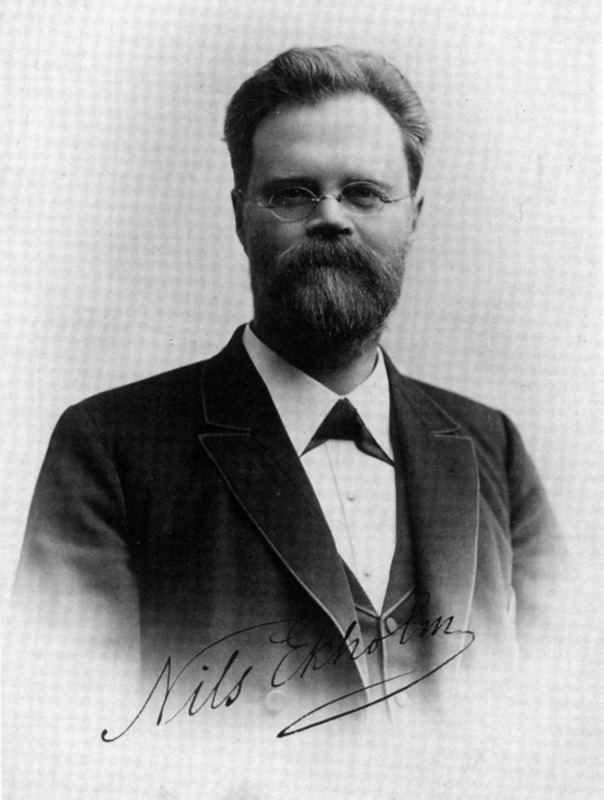 Nils Ekholm, 1913, the year of his appointment as Director of the Central Bureau of Meteorology. Image courtesy Wikipedia. The history of research on climate change from the 19th century to the present, told in a set of hyperlinked essays. The life and work of Joseph Fourier. 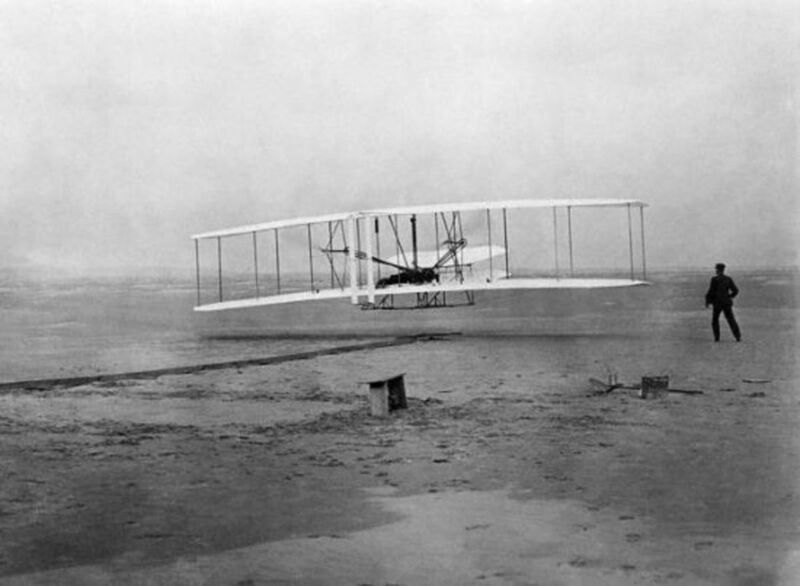 This Hub is fifth in a series, preceded by "Global Warming Science And The Dawn Of Flight." It recounts the life, work and times of the genius Svante Arrhenius--his Nobel-prize-winning research changed chemistry chemistry forever. But he was also the first to build a mathematical model of a CO2-warmed planet. Yes, this took way too much time from any practical standpoint--but I'm a musician, how practical am I really supposed to be, anyway? One final update on January temperatures: on February 3, Dr. Spencer posted the January global anomaly. In line with the last update, that anomaly appears to have been the highest since the 1998 El Nino, at a very warm .72 degrees C.
And yes, it's still cold over much of Eastern North America, and in Eastern China, among other places. Not so much Africa, South America or vast swathes of the South Pacific--or portions of the Arctic, ironically enough. As of 1/22/2010, Dr. Spencer's daily update page shows the lower troposphere temperature tracking at what *appears* to be record high levels--at least, the trace is tracking above any year since 1999. In any case, the data are certainly busting any lingering thought that the New Year's cold snaps were anything more than that. One more brief comment on John's question. He is also one of the lead scientists maintaining the satellite temperature record at the University of Alabama Huntsville (UAH.) As of 1/10/2010, the lower troposphere temperature globally was .69 F warmer than the corresponding day in 2009. You can also navigate back through this site to access all kinds of climate data, including a report on 2009. 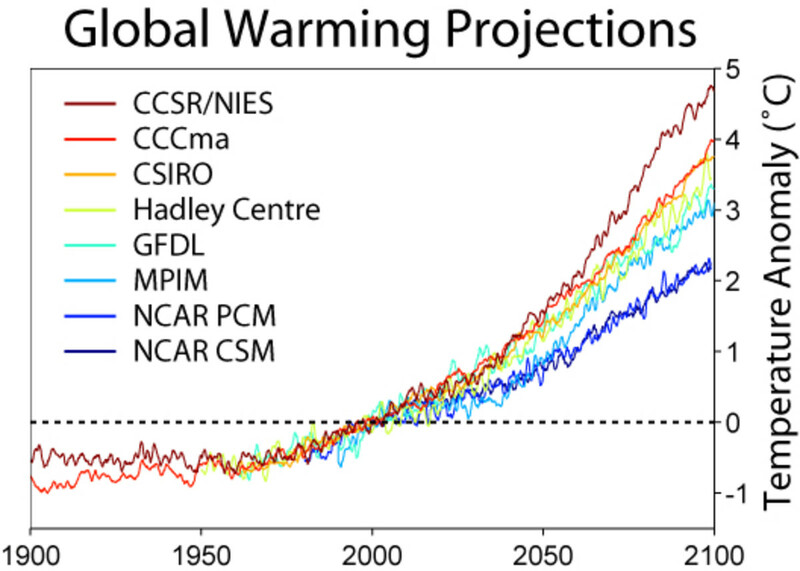 "Tamino" runs a climate blog called "Open Mind" which provides a lot of in-depth discussion of climate statistics. (He is a professional statistician.) This discussion may be relevant to your request; but there a LOT on the site, so try browsing his topics as well. Hope this helps!--and let me know if you have something else in mind. Second, the time frame is too short. Climate is the average of weather, more or less. The accepted short answer is that you should typically look at these things over periods of 30 years or so. What happens in a month or even year is not climate. Thanks for your comment, John! Got to go to my day job now, but I'll post some links in a followup comment later today or tomorrow. This is a great piece. Please provide any resources to help explain why short-term experiences of severely cold weather like we have in the U.S. and Great Britain right now are not proofs that global warming is false.